Crossover Review: The 2009 Nissan Murano looks like its predecessor in many ways, but it has more creases and folds than the original Murano. It's a more modern look, but not necessarily better. Nissan calls the interior a "mobile suite." It's intended to be modern and warm, with ambient lighting and upscale materials. 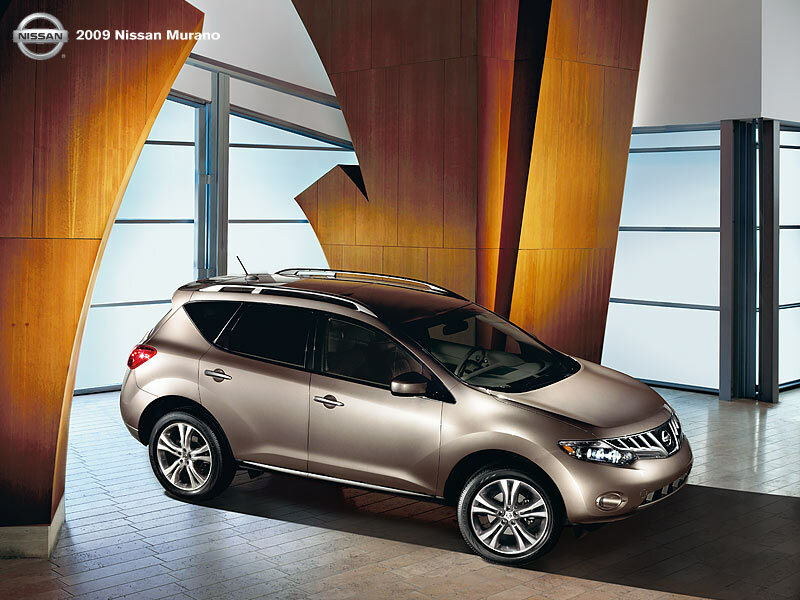 When Nissan introduced the Murano in 2003, there wasn't anything else quite like it. Aside from being one of the first mid-size crossovers, the Murano was shaped like an egg and drove more like a roller skate than an SUV. It was a winning formula that proved to be ahead of its time as fewer people wanted to drive traditional SUVs and more people said, "I want to drive an egg-shaped roller skate!" Today virtually every car company makes something like the Murano. Some of them are oval skateboards while others are bulbous wind-up toys, but they all fulfill the same basic mission, offering SUV-like space in a fun-to-drive package. Now that the Murano has lost its near monopoly status, what is Nissan to do? The answer comes in the 2009 Murano, a complete redesign of this segment-busting crossover that has a new body, new interior and new focus on technology. Like a lot of carmakers, Nissan is trying to move the Murano upscale to compete with entry-level luxury SUVs and position itself above its new competitors. Yes, it has more eye candy, like a rear-view camera, a continuously variable transmission, push button ignition and an LCD screen for controlling it all. It also has a new, more luxurious driving feel. Like the new Nissan Altima platform on which it's based, the Murano has been softened compared to the previous generation to give it a smoother ride. Now it's like roller skates on a cotton candy sidewalk, still fun but also more comfortable than before. Performance is above average for a crossover, mainly because of its nimble handling but also because of the instant response of its 3.5-liter engine that makes 265 horsepower. And what about the egg shape? The new Murano still looks similar to the old one, but the round edges have been hardened with gentle creases and folds. I don't think it looks any better than the old one and is certainly less distinctive than the previous generation, but other people may disagree. I do think it's lost some of its love-it-or-hate-it personality. Inside, Nissan created a look it calls a "mobile suite" that's meant to be warm and modern. Ambient lighting, nice aluminum-look trim and a curved instrument panel make it a more inviting place than the old Murano, although fit and finish aren't quite up to the luxury standards Nissan seems to be shooting for. The 2009 Murano starts at $26,330, not a bad price for its combination of style, performance and practicality. Some of the high-end versions can get expensive, though, topping out around $36,000 for an all-wheel-drive LE model. A navigation system adds $1,850, and a DVD player costs $1,600. Overall, the new Murano is a step up from the old one. As more people jump on the egg-shaped-roller-skate bandwagon, the Murano can still hold its own. What was tested? The 2009 Nissan Murano SL AWD with a base price of $29,480. Options on the test car: The Premium package at $1,000. Price as tested including the $745 destination charge: $31,245. Why avoid it? It looks different from the old Murano, but not necessarily better. Why buy it? It's as practical as an SUV but a lot more fun to drive. It's more luxurious than the old Murano.